The new Chinese Shanghai University Postgraduate Program Scholarship is now available on offer for all new international students around the world. The program provides a full scholarship which covers tuition waiver, accommodation, living allowance, and comprehensive medical insurance. The Chinese Government sponsors the Chinese University Postgraduate Program Scholarship, and it is a full scholarship for designated Chinese universities and certain provincial education offices in specific provinces or autonomous regions to recruit outstanding international students for graduate studies in China. The Shanghai University of Finance and Economics, known affectionately by its students as “SUFE”, started life way back in 1917 – in the city of Nanjing of all places. What once started off as a mere business program, soon flourished and eventually evolved into what is now considered to be China’s top finance university (ACU University Rankings 2010-2012), and one of the top business universities. 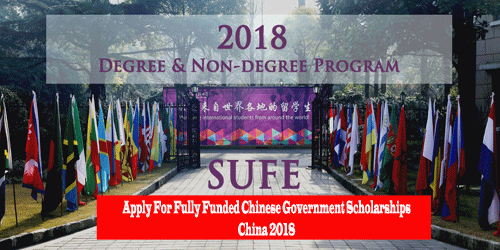 SUFE was one of the very first universities in China to create post-doctoral research centers in the fields of economics and management, and it was also one of the leading universities to first offer MBA and EMBA programs. Please visit their official site (from January 2018) and click “Application Online” to log in, submit online the completed “Application Form for Chinese Government Scholarship” and print a hard copy and keep it. Visit the Official Scholarship Website Click Here for more details. 1 responses on "Apply For Fully Funded Chinese Government Scholarships, China 2018"